I love everything bagel flavored anything. I love soft bread and savory versions of my favorite sweet treats. I love toasted bagels with scallion and chive cream cheese smeared all over them. And I absolutely love sharp cheddar cheese. Yesterday, I was craving fresh, hot pizza. But we had a lot of leftovers to eat for dinner. Since I never like to let anything go to waste, the pizza would have to wait. But I still did not want to let that thought go. So, I compromised. We needed a little bread to go with dinner, anyway. At least that is how I justified making this easy focaccia to jazz up our plates. And, today, there is barely any left. So, I guess I didn’t need to make any justifications, anyway. If you are looking for a hearty soup that is not too heavy, this one is the perfect solution to your problem. Browned ground chicken and onions with all the spices you love in a good, stick to your ribs chili. Cannellini beans and Swiss chard give this soup and Italian twist. Top it off with some freshly grated Parmesan cheese and chopped parsley. An untraditional crostini with green onions, chive, cream cheese and more Parmesan bring it all together into a satisfying meal. The first time I made this was in 2012 when I saw an episode of Giada De Laurentiiis’ cooking show on the Food Network at that time. She also served it with a crostini but I cannot seem to find that recipe, so I had to riff on it, instead. Everytime I make this easy to put together soup and bread combination, I get rave reviews. I should take this one out more often! In a large pot, heat oil over medium high heat. Add the onion and cook until softened, about 5 minutes. Add garlic and cook about 30 seconds. Add the ground meat, 1 teaspoon salt, cumin, oregano, and chili powder. Cook, stirring frequently until the meat is browned and cooked through about 8-10 minutes. Stir the flour into the meat mixture. Add the beans, Swiss chard, corn and chicken stock. Bring mixture to a simmer, scraping any browned bits from the bottom of the pot. Simmer for about 50-60 minutes until liquid reduces and the chili is thickened. Add the red pepper flakes, taste for seasoning and simmer for another 10 minutes. Serve with Parmesan cheese and parsley. Preheat boiler in oven. In a small bowl, mix cream cheese, salt, pepper, green onions and chives. Spread mixture on one side of each slice of bread. Place bread on a cookie sheet. Sprinkle each slice with Parmesan cheese, making sure it adheres to cream cheese mixture. Broil bread slices for 2-4 minutes until cheese melts and turns brown on edges. Allow to cool for 5 minutes before serving. Check out this satisfying meal for one. Just add guilty pleasure t.v. watching and a comfy couch. @notesfromvalskitchen has the story and recipes. Follow link in their bio. Blood Orange Pie...creamy, sweet/tart orange filling inside crisp, flaky dough. I am dreaming about sunny days as I devour each bite. Recipe on blog, link in bio. Entertaining tonight? Go old school and try out Crab Puff. All you need are these ingredients, some spices and a cocktail. Recipe and story on blog. Link in bio. My new book is now available on amazon.com It's a collection of blog posts from 2008-2016 written on my other home on the internet, notes from val's kitchen. @notesfromvalskitchen link in bio to my other not-so-secret blog life. 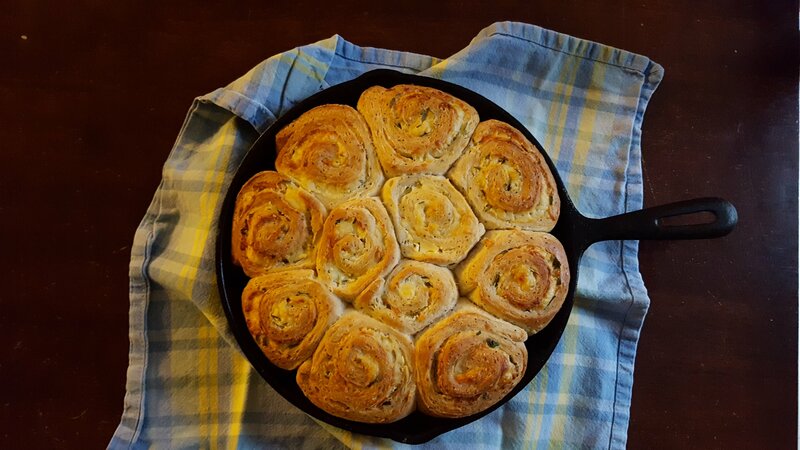 Everything Bagel, Cheddar and Chive Swirl Buns. The pefect savory accompaniment to a glass of red wine. Check out the recipe on the blog, link in bio. underground soup company Blog at WordPress.com.